Dual Texture - U.S. Army digital camouflage. 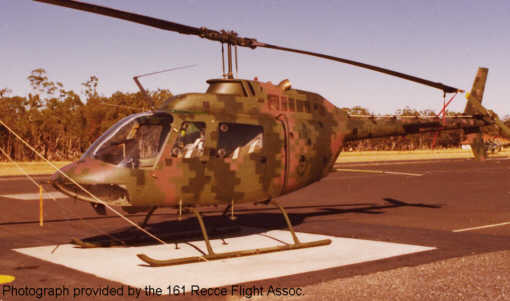 Kiowa A17-007; Delivered 1971. Used for Kiowa Camo Trials by 171 command and liason Sqn 1979-80. Painted in the Dualtex pattern with matt finish. In Service with Australian Army. 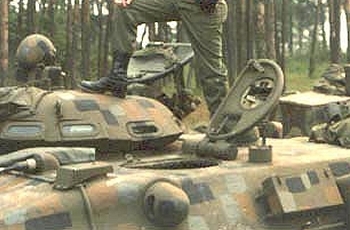 Dual Texture Camouflage (Dual-Tex for short), is not a new revolutionary digital camouflage but at three decades old, these initial digital patterns were once used by the U.S. Army 2nd Armored Calvary Regiment in Europe from 1978-the early 1980’s (see photos on this page) were replaced when they adopted the standard NATO three color camouflage. Dual-Tex style patterns are now finding their way back into the Military in a big way. Lieutenant Colonel Timothy R. O’Neill (U.S. Army, Retired) and West Point professor of engineering psychology can be called the father of digital camouflage with the development of Dual-Tex and his understanding of visual biophysics and human visual performance makes him the leading expert in the field of camouflage. Lt. Col. O’Neill has shown with objective studies that a digital pattern when applied correctly, actually reduces the detectability reduction in the range of 50% compared to 3-color NATO and unpatterned targets. So why did digital camouflage disappear (no pun intended) for the past few decades? Trying to convince a layman that squares work better in nature can be a difficult sell, it goes against what people think they perceive in natural settings. Only recently has Lt. Col. O’Neill’s work seen a new interest with the Canadian CADPAT uniform camouflage in the late 90’s the U.S. Marines MARPAT uniform pattern in 2001 and most recently the U.S. Army Combat Uniform pattern 2003, the Finnish and Chinese have also come out with their own digital patterns and Tiger Stripe Products has recently announced Tigerpat and Tigerpat Plus 2004 for the military and civilian market. Field-testing with most of these digital patterns show improvements of traditional camouflage, but there is much more room for improvement. While Lt. Col. O’Neill’s initial work is the base for these recent digital patterns, his years of research have shown a number of other factors and recommendations have been ignored in all digital patterns for uniforms. His extensive findings and current research is now being applied to the latest digital patterns being developed for the U.S. Military. Those factors should lead to more effective concealment for the men and women who go in harms way to protect our freedom. Timothy R. O’Neill is still actively involved in Camouflage research and development. He is a consultant on military training and technology in the Washington, DC area, and an active Civil War reenactor. Mr. O'Neill is a retired Army officer, and served for 25 years in staff, command, and training assignments, including two years in combat; he has commanded tank and armored cavalry units and served on battalion and brigade staffs. From 1976 to his retirement in 1991, he served as a member of the permanent faculty of the United States Military Academy. He earned the BA degree from The Citadel, the MA from the University of North Carolina, and the Ph.D. from the University of Virginia; he is also a graduate of the Armed Forces Staff College. He is author of The Individuated Hobbit and the novel Shades of Gray as well as numerous articles and monographs on military and scientific topics. He is a member of the American Psychological Association, the Human Factors and Ergonomics Society, and the C. G. Jung Institute. He was recipient of a DuPont Fellowship and various military awards for valor and meritorious service. Since his retirement from active duty, he has served as Vice President of Star Mountain, Inc. and as president of Cavalry Security Gear and Systems, Inc. He currently consults on topics ranging from camouflage technology to counterterror. Additional Oct 21, 2004: Both patents issued for CADPAT and MARPAT site Lt. Col. O'Neill's work as the basis for each of these digital patterns.